← Can You Hear The Bells? Can you believe it’s August already! Where did summer go? As I sat contemplating this question I realized that I haven’t done everything I wanted to do this summer. I still have a list of fun activities to do before the weather turns cold. If you are like me, you have a whole bunch of ideas for the sunshine, but what about the evenings? There is one event you may not have considered but should definitely be put on your list to do. There is one more chance to meet Sylvan this Saturday 25th at 7:00pm. 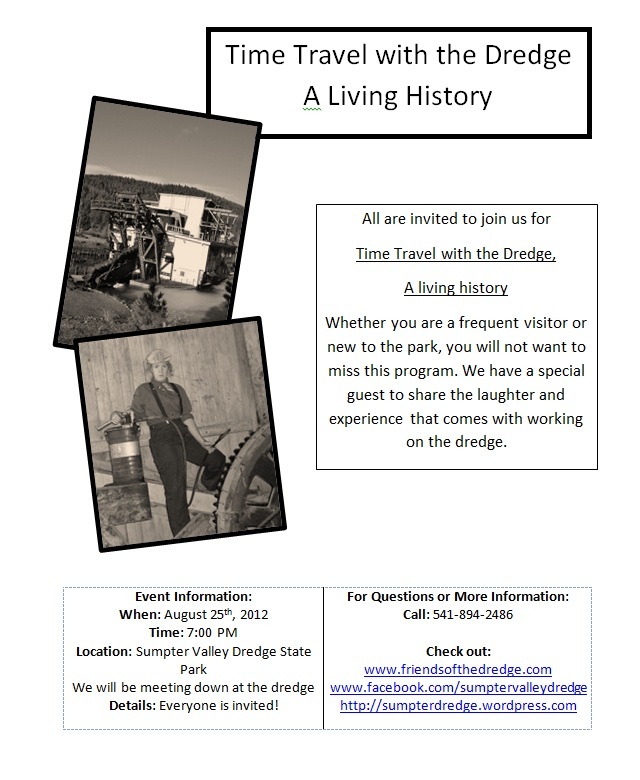 Come share in the laughter and experience of the dredge. This program is fun for all ages. So bring your friends and family to this fun event. This entry was posted in Camp Fire, Dredge Stories, Events, History. Bookmark the permalink. It’s ok, I completely understand! Randi said she’ll tape it tonight for you. Hope everything is going good. Have fun on your trip! Get lots of sun and have lots of fun!